On Thursday, retired research scientist Richard T. Buffler returned to the University of Texas Institute for Geophysics (UTIG) to witness the continuation of the Gulf Basin Depositional Synthesis (GBDS) project — a program he helped launch more than 20 years ago — and introduce a postdoctoral fellowship that will bear his name for years to come. GBDS is an industry-supported data set that provides context for exploration in the Gulf of Mexico. It allows oil and gas companies to reduce their overall risk and uncertainty by answering questions about the depositional history of drill sites before a great deal of resources are invested. Twenty years is a good run for any project, but especially one funded by soft money, which means there is no guarantee funding will continue. Almost every year the GBDS team goes back to industry representatives and asks them to renew their agreements. At the end of phase 10, 32 companies had agreed to support the project. 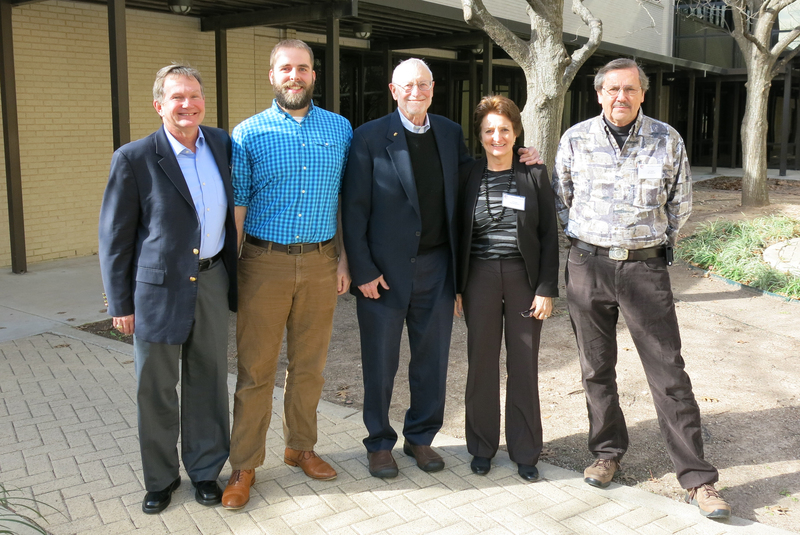 The Richard T. Buffler postdoctoral fellowship is funded by royalties from the sale of reprocessed reflection seismic data through a cooperative effort with ION GXT that in 2015 exceeded $4.3 million net to the University of Texas and UTIG. The data was collected in the late 1970s as part of UTIG’s mission to study the tectonic history of the earth, and then archived by Ganey-Curry with no intention of using it for oil exploration. But when Mexico altered its constitution to open the door for oil and gas companies to drill in its waters, the value of the data skyrocketed and it has since become the second largest royalty producer in University of Texas history. The first-ever Richard T. Buffler postdoctoral fellowship has been awarded to Chris Lowery, who started his work at UTIG in July. Lowery is a biostratigrapher with previous experience in the oil and gas industry. He will help develop the sedimentary history of the Gulf of Mexico in addition to mentoring graduate and undergraduate students. Entering phase 11, the GBDS project will begin looking beneath an older salt layer for oil and gas. Similar strategies have yielded successful results in Brazil and Angola, but UTIG and the GBDS team are the first to conduct this type of research in the Gulf of Mexico.